Are you looking to step up to a higher level with your next new car purchase? Is your goal to cruise the streets of Santa Rosa in something a bit more luxurious? If the answers to these questions are yes, then you may want to consider the 2019 Volvo S90 sedan. 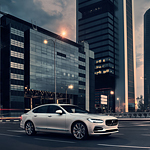 There is much to appreciate about the 2019 Volvo S90 sedan. The gear knob is leather-clad and blends seamlessly with the overall aesthetic on the Volvo S90's interior space. This is coupled with a hand-stitched, leather wrapped 3-spoke steering wheel that comes in a uni deco trim adding satin silk to the wheel. Together, these two features that highlight the vehicle's detail towards luxury and feel great in the hand. The S90 also has powered front seats. Each of these allows occupants to adjust the positioning of the seat effortlessly until the ideal position is reached. The front seats also come with lumbar support to ensure seating is as comfortable as possible.